In laboratories, using instruments that can provide precision measurements is especially important. Historically, the challenge has been that purchasing scales for laboratory use required a compromise. If you were to choose a standard strain gage scale, you would be sacrificing the resolution of the scale. However, if you chose a magnetic force restoration scale, you would be sacrificing your budget and also be forced to purchase a product from an overseas company, which can translate into inflated shipping costs, and questions related to reliability. At Arlyn Scales, we’ve heard this question many times, which prompted us to see if we could develop a solution that could not only deliver precision measurements in a laboratory setting, but at a price that is budget friendly. Arlyn Scales, based in Long Island, New York, has been manufacturing scales for more than 30 years. While we were well aware of the common issues related to precision weighing instruments that plagued laboratories for so long, we’ve never been a company that backs down to a challenge. While strain gage scales offer adequate accuracy for most industrial applications, they do not offer sufficient accuracy for laboratory environments. This shortcoming is primarily due to the use of strain gage load cells. The load cell is without a doubt the most important component of a standard industrial scale. Its duty is to measure the weight of any item placed on a scale platform and produce the value that you read on a scale indicator. The load cell incorporates thin sections, called flexures, which allow it to bend, as a type of spring element. During manufacturing (four sections commonly referred to as flexures) are added into the spring element design. Strain gages are then attached to these flexures and wired together, forming a Wheatstone’s bridge. When an object is placed on the scale platform and the spring element begins to bend, the flexures also bend, causing a change in the resistance of the strain gages, and therefore a change of the bridge voltage. The voltage is then sent through an analog-digital converter, which allows the digital signal to be transmitted to the display indicator, where numbers on the screen relate to the weight on the scale platform. One of the primary issues with a standard strain gage scale is the inverse relationship that exists between the scale’s capacity and resolution. The higher the capacity, the lower the resolution, and vice versa. Even at lower capacities of around 10 pounds, a standard strain gage scale can only provide resolutions of up to 0.002 lb. While this may be enough for some applications, it can be worrisome for laboratory environments that require precision measurements. And, as the capacity increases, the resolution drops significantly becoming even more of a problem in most labs. For instance, a 100-pound strain gage scale would only be able to provide accurate measurements up to 0.02 lb. or possibly 0.01 lb. at most. In the past, the predominant alternative to a strain gage scale was a magnetic force restoration scale, which uses force motor technology to generate more accurate measurements. These scales use current in an electromagnetic force to oppose the weight of the item on the scale. The amount of current used is proportional to the weight on the platform. 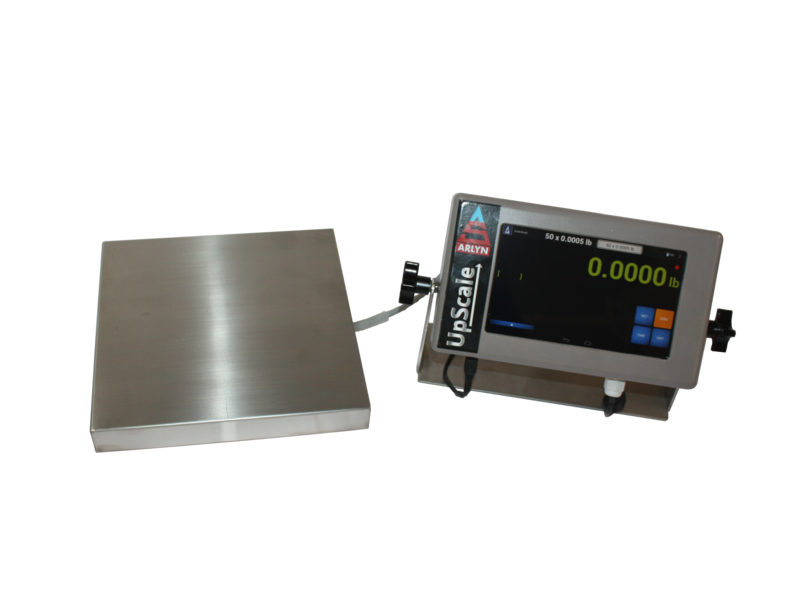 While MFR scales offer precision measurements, the maximum capacity is usually only around 25-50 pounds. These scales can also be extremely sensitive to air currents, changes in temperature and vibrations, making them extremely temperamental in lab environments. Aside from the drawbacks listed above, MFR scales are also extremely expensive, often costing more than 10 times the price of a high-quality strain gage scale. So, if you’re looking for precision measurements and can’t turn to strain gage or MFR scales, what are you to do? Thankfully, Arlyn Scales has an answer, which is our Surface Acoustic Wave technology. At Arlyn Scales, we’ve developed internationally patented Surface Acoustic Wave technology that addresses all of the major limitations seen with both force motor and strain gage technology. With our design, we take some of the positives seen with strain gage load cells, and rather than use strain gages, we use two SAW transducers attached to opposite ends of the spring element. One of these acts as a transmitter and the other a receiver. The receiver takes the SAW wave that is being sent and transfers it through an amplifier and sends it back to the transmitter, creating a feedback loop. The frequency that results corresponds directly to the distance between the two transducers. When the scale has no weight on the platform, the transducers are a certain distance apart. By taking the measurement of the frequency, we’re then able to ascertain the exact weight of an object on the platform. For Arlyn Scales, high quality design and craftsmanship are a requirement for any of our scales. Our SAW scales feature a fully digital output stream compared to strain gage scales that must rely on an analog-to-digital conversion, making our SAW technology inherently more accurate. Unlike strain gage scales that could have a readability of 1:5,000, our Surface Acoustic Wave scales have a readability of 1:100,000, roughly twenty times higher. 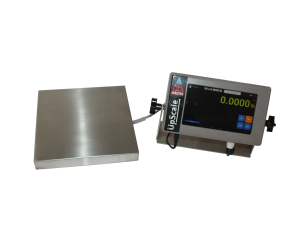 Because there is so little movement required to produce an accurate measurement, our SAW scales have a maximum capacity of 500 pounds with a resolution of 0.005 pounds, far superior to an equivalent strain gage scale. When it comes to cost, our SAW scales are priced close to what you might pay for a high-end strain gage scale and roughly two thirds less than the price of an MFR scale. We hope that we’ve piqued your interest surrounding our Surface Acoustic Wave Technology for laboratory use. Feel free to contact our sales team today by phone or through our online contact form. We look forward to showing you the many features seen in our industry leading SAW scales.